Join us in attending Future, an event presented by Compositum Musicae Novae! 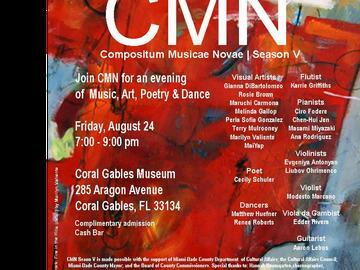 Future will be a night of music, art, dance, and drinks at the Coral Gables Museum. At this free event, we will feature a wide variety of chamber ensembles performing new music by living composers. You can can expect performances of new works for solo piano, string quartet, bass with electronics, a trio of violin, cello, and flute with electronics, and live dance with fixed media. We will of course also have our famous art gallery, poetry recitations, and complimentary refreshments! Seating is limited. Reserve your FREE tickets at www.cmnarts.org now! CMN Season III is made possible with the support of the Miami-Dade County Department of Cultural Affairs and the Cultural Affairs Council, the Miami-Dade County Mayor and Board of County Commissioners. Please do not audio or video record event. Please do not use flash photography. Doors open at 7:00 PM, and seating begins promptly at 7:30 PM. Thank you.